5 Bedroom Detached House For Sale in Colchester for Guide Price £650,000. Colchester Abbotts is proud to offer you this beautiful new build house on Ipswich Road, Colchester. 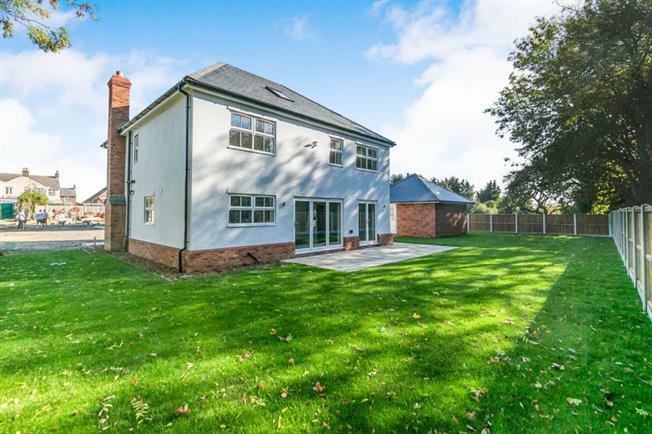 Built to a high specification is this newly built five bedroom detached executive family home, backing on to Highwoods Country Park. The property has been built to a particularly high standard and benefits from under floor heating to the ground floor with a ground floor cloakroom/WC, spacious sitting room, separate dining room and an impressive kitchen/diner/family room with separate utility room. The first floor boasts a modern bath/shower room with four well proportioned bedrooms, two of which benefit from en suite shower rooms. The top floor boasts the master bedroom with a separate dressing room area and en suite shower room. Externally the property provides off street parking for several vehicles with access to a double garage, with a private rear garden backing onto Highwoods Country Park. Kitchen/Diner/Breakfast Room 9.3m (30'6) x 4.62m (15'2) reducing to 11'7"
With bi-fold doors on to the rear garden. With electric up and over door, power and lighting.